St. Mary’s University welcomed Michael A. “Mickey” Schott (B.B.A. ’68) as the new chairman of its Board of Trustees at a regular meeting on Sept. 7. 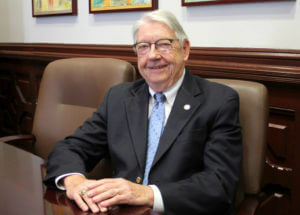 Schott, a certified public accountant and president of the Gorman Foundation, officially began his term as chairman of the St. Mary’s University Board of Trustees on June 1. The University has also named a new chancellor, the Rev. Oscar Vasquez, S.M., who is the Provincial of the Marianist Province of the United States, and nine additional new trustees. Schott is a graduate of the Harvard Business School Owner/President Management Program. He was also a partner in the Tsakopulos Brown Schott & Anchors accounting firm before retiring. Schott received the Distinguished Alumnus Award in 1999 and, as a former Rattler Baseball first baseman, was inducted into St. Mary’s Athletics Hall of Fame in 2002. The U.S. Army veteran is a past-president of the Alumni Association. He also served on the St. Mary’s Board of Trustees from 2009 to 2017. The robust Fall 2018 class of freshmen is among the largest in the University’s history and among the most academically gifted — with increases in both average GPA and average SAT score. The incoming class also represents greater geographic diversity — including students from 21 states and Puerto Rico, as well as 15 countries. Vasquez is a native of San Antonio. He professed first vows in 1987 and was ordained in 2005. Vasquez has a bachelor’s degree from Our Lady of the Lake University and a master’s in Secondary School Administration from the Pontifical University of Saint Thomas Aquinas in Rome. He has been a high school teacher, chaplain and principal. Prior to becoming Provincial, he was ministering in St. Louis as chaplain at Chaminade College Preparatory and assistant pastor at Our Lady of the Pillar Parish. Michael “Terry” Martin (B.B.A. ’81), Owner and President, Anodyne Wool, Inc.
Michael “Mike” Martinez (B.A. ’85), Corporate Director of Quality Assurance, C.H. Guenther & Son, Inc.